Are you looking to create a more outward looking church? Are you wondering how to create an environment where seekers feel welcome to ask their questions? Alpha is a series of interactive sessions that freely explore the basics of the Christian faith in a friendly and honest environment. No pressure. No follow up. No charge. Alpha runs in churches, homes, coffee shops and bars all around the globe. Typically it has ten sessions, which include food, a short talk and a time of small group discussion where you can share your thoughts. It covers topics such as, "Who is Jesus? ", "Why and how do I pray? ", and "How can I resist evil?" Alpha is a great way to mobilize your church body and reach your community with the gospel. Because Alpha requires a team and some training, you will need some time to prepare. We have teams ready to help. TRAINING: Attend a local "Run Alpha" training event. Find one near you at alphausa.org/training. NEXT STEPS: View your next steps at alphausa.org/start. 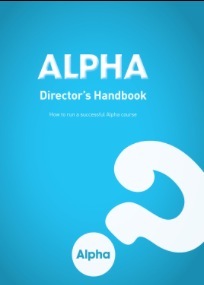 RESOURCES: We have an array of tools for training, running and promoting Alpha at alpharesources.org. HELP: If you have any questions or need help, your regional director is available to assist you. Origin: USA An absolutely vital handbook for any Alpha Course Director, the person who is responsible for doing all the organizational and administrative work for the course. This comprehensive booklet covers every stage of preparing for and running your course successfully. A detailed and thorough resource that contains reusable timetables, checklists, suggestions for selecting your team, forms for recording and organizing information, walkthroughs for each of the fifteen talks, guidance on planning the Day or Weekend Away and much more. As a Course Director, this is one of your most critical tools for planning and administering an effective course in your church or community and can be used as a reference for planning more courses long after your first one. If you are planning to start an Alpha course in your church, home or small group, how do you get started? 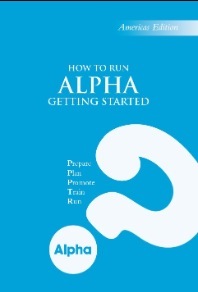 Hopefully you are able to attend an Alpha training event, but the Getting Started booklet will also be of great help. This quick start guide summarizes the basic process of starting your Alpha Course in an easy-to-follow, step-by-step method (preparation, planning, promoting, training and running). Essential for anyone planning to run Alpha, these sixteen page booklets are great for passing out to your ministry leaders or pastors who are heading up the course, as well as passing on to leaders and pastors in other churches who are thinking of running Alpha. Click Here to download this FREE booklet! Give us a call or shoot us a quick email. We are always here to help.